Sitting on the Florida Pines community is this four bedroom villa with a well-equipped games room ideal for your family getaway to Orlando. Situated on the US27, the Disney theme parks are just a twenty minute drive away. King-size bed, slide closet, TV. En-suite bathroom contains shower over bath, sink WC. Situated on the US27 in Davenport, just a short drive from the US192 and I-4 is this four bedroom villa on Florida Pines. With a good-sized pool on a south facing pool deck, a well-equipped games room and just a twenty minute drive to the Disney area, shops and restaurants, there is lots locally for everyone to enjoy during your Orlando stay. Living Accommodation - At the front of the villa to the left-hand side is the formal dining table with seating for eight people. The formal lounge is a little further in to the villa with a sofa, loveseat and armchair. To the right of the formal lounge is the open-plan kitchen with an additional table which seats four people. Adjacent to the kitchen at the back of the villa is the family lounge with a sofa and a loveseat, a flatscreen TV and patio doors to the pool deck. Bedrooms - The Master bedroom is to the left of the main family lounge with a King-size bed and an en-suite bathroom. Bedroom 2 is immediately inside the front door to the left-hand side and has a Queen-size bed. Bedroom 3 is next to bedroom 2 and has twin beds. Bedroom 4 is to the left of the formal lounge and also has twin beds. Outdoor Living - The south facing pool deck has a good-sized pool and an outdoor dining table seating four people. Entertainment - The games room is equipped with a football table, basketball game, air hockey and seating. As you drive into the community the white picket fence overlooking the green fields gives Florida Pines a real country feel. The community was built in 2002 and is situated just off the US27 and a few miles south of the popular tourist corridor of the US192. 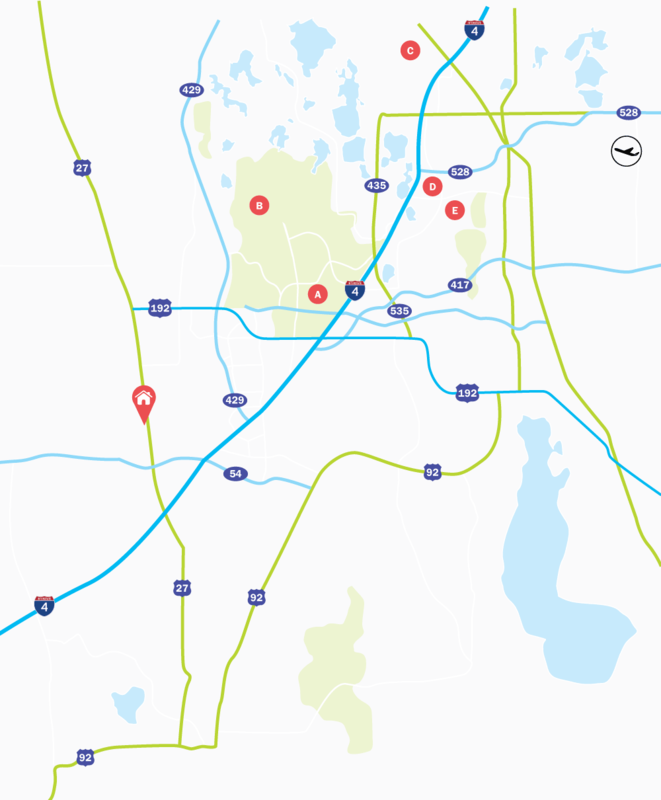 The I-4 highway is a short drive south from here as well meaning that Florida Pines is ideally situated to reach all the places you want to visit.